This sensational 'piece' is inspired by the dramatic hair combs worn by the iconic 1940s Hollywood Starlets. This large dramatic floral hair comb takes inspiration from classic hair accessories from the 1930s and 1940's Hollywood era. 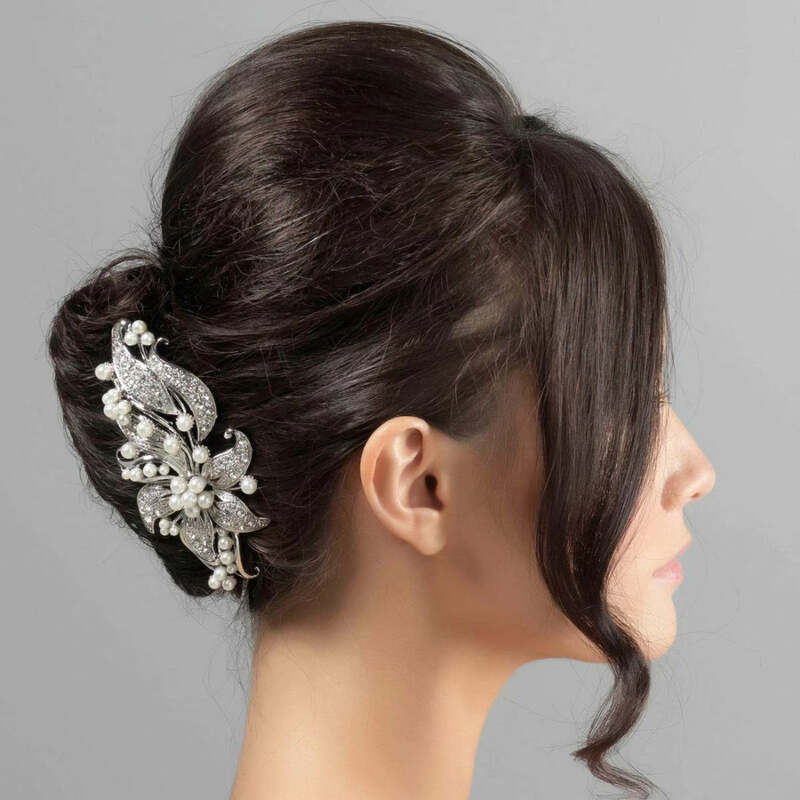 Featuring a trailing lily encrusted with clear Austrian crystals and pale ivory faux pearls, this oversized silver tone hair comb oozes Silver Screen glamour. The perfect headpiece for thicker, longer hair types and up-do's, it looks fabulous worn at the side of the head to dress a chic up-do, set in an elegant French pleat or off-set in a romantic loose chignon. Bold and dramatic, this floral comb looks fabulous coordinated with crystal and pearl earrings and bangle for glamorous movie star style. 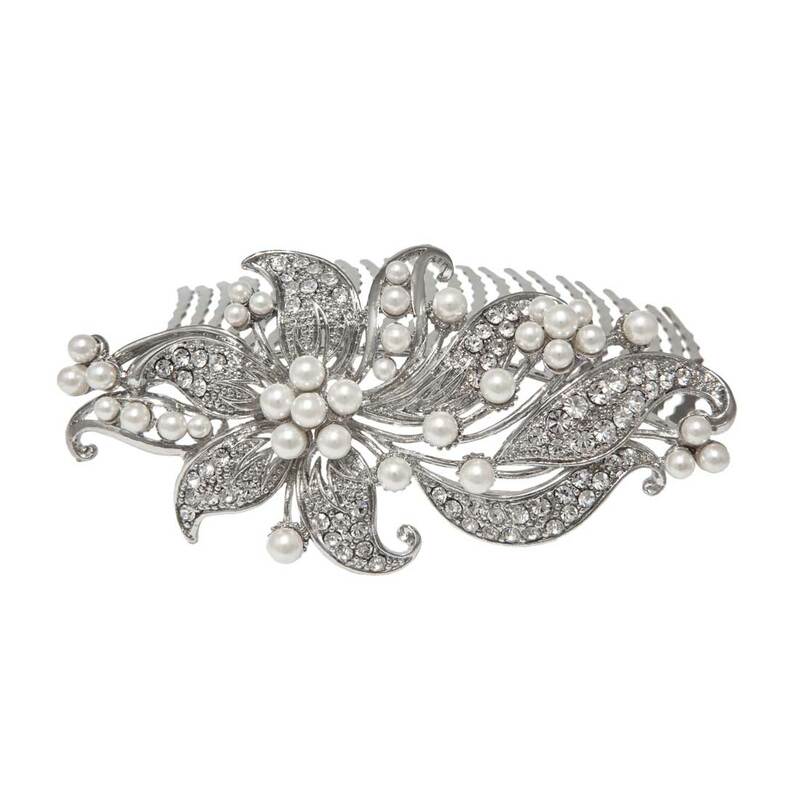 A beautiful wedding hair comb for brides who adore dramatic crystal and pearl headpieces from the 1940s, this would compliment a vintage inspired bridal gown with timeless glamour. When my hair comb arrived I was a little hesitant in opening the box not sure what I would find but I nearly fell over the piece was so beautiful. It is truly something I can start a family tradition with - absolutely lovely. It was packaged so well also. Can't wait for the big day. I LOVE this piece! I wore it on my wedding day and it was just the classic yet statement piece I was looking for. The quality of the piece is also outstanding for the price. There is a lot of detail and although it is a heavy piece it stayed in my hair all day without slipping! Loved it!